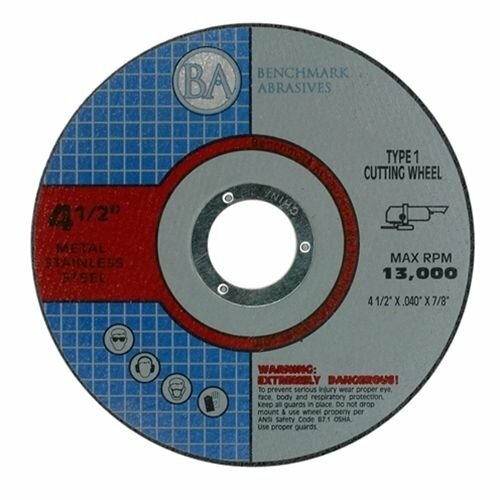 Optimize your metal cutting work with these 10 Makita Premier 4-1/2" Cutting Wheels for Metal and Stainless Steel such as rebar, steel pipe, structural & galvanized steel, sheet metal, structural tubing, black steel, cable and small to medium diameter solid pieces. When cutting, consider applying the proper amount of pressure at a 90 degree angle to allow the cutting wheel to do the work. For best results, consider not pushing too hard on the wheel, which can cause the grinder to stall or kick back or give a less efficient cutting action, while also increasing the chances of slippage or loss of control of the tool, resulting in injury or damage. Applying light to moderate pressure and consistent movement will provide the most efficient cut and minimize heat build-up. Consider using light pressure and a consistent motion throughout the cut for the fastest cut-rate and prolonged wheel life. Excessive pressure through the cut causes increased friction and heat build-up, which can cause increased heat discoloration of the work piece and reduced wheel life. For demanding applications, higher amperage &/or torque angle grinders provide easier, long-lasting & efficient cuts. 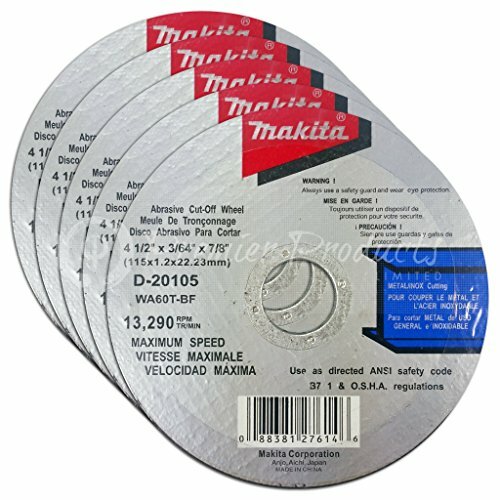 Optimize your metal cutting work with these 5 Makita Premier 4-1/2" Cutting Wheels for Metal and Stainless Steel such as rebar, steel pipe, structural & galvanized steel, sheet metal, structural tubing, black steel, cable and small to medium diameter solid pieces. When cutting, consider applying the proper amount of pressure at a 90 degree angle to allow the cutting wheel to do the work. For best results, consider not pushing too hard on the wheel, which can cause the grinder to stall or kick back or give a less efficient cutting action, while also increasing the chances of slippage or loss of control of the tool, resulting in injury or damage. Applying light to moderate pressure and consistent movement will provide the most efficient cut and minimize heat build-up. Consider using light pressure and a consistent motion throughout the cut for the fastest cut-rate and prolonged wheel life. Excessive pressure through the cut causes increased friction and heat build-up, which can cause increased heat discoloration of the work piece and reduced wheel life. For demanding applications, higher amperage &/or torque angle grinders provide easier, long-lasting & efficient cuts. 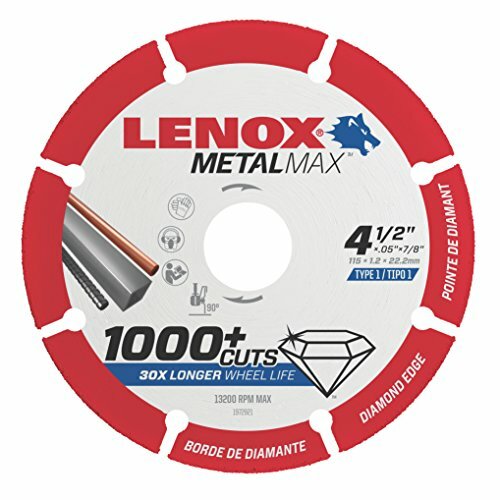 Lenox MetalMax is the new standard for metal cutting abrasives. Breakthrough diamond technology delivers 1,000 or more cuts (30 times longer life than thin bonded cutoff wheels)* without sacrificing speed or finish. 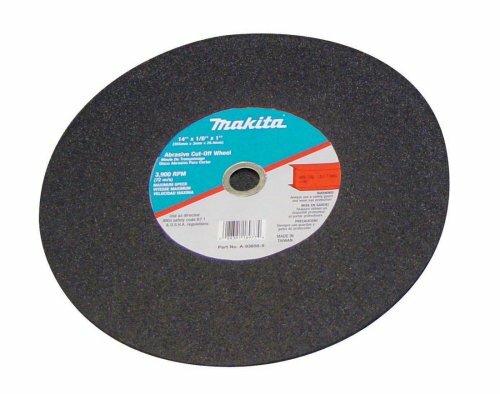 Made of solid steel to greatly reduce the risk of breakage, the combination of a steel body with a diamond edge allows MetalMax to hold its original wheel diameter until the last cut, meaning better control, reach, and cut precision throughout the wheel life. The enhanced design substantially reduces dust particles and lessens odor. Lenox MetalMax is suitable for metal cutting applications including steel, sheet metal, stainless steel, rebar, cast iron, aluminum and non-ferrous metals, and works at the same speeds and feeds as thin bonded abrasive wheels. Advanced diamond technology provides 30X longer life than thin bonded cutoff wheels in metal cutting applications* *Average performance in 1 carbon steel square tube vs. thin bonded abrasive cutoff wheels. The cutting wheel will break under large pressure. The test can first be carried out on the waste. (1/8" / 3.2 mm) mandrel as much as possible for small size saw blades. The mini rotary tool is suitable for DIY projects and the home hobbyist. Mini Rotary Tool Kit: 20 resin cutting wheels, 10 diamond cutting wheels with 2pcs (1/8'' /3mm) Mandrel, 6 HSS Cutting Saw Blade Discs with 1pcs (1/8'' /3.2mm) Mandrel, 1pcs For Circular Saw Blades (1/4'' /6mm) Mandrels, 2pcs For Resin Cutting Wheels (1/8'' /3mm) Mandrel. 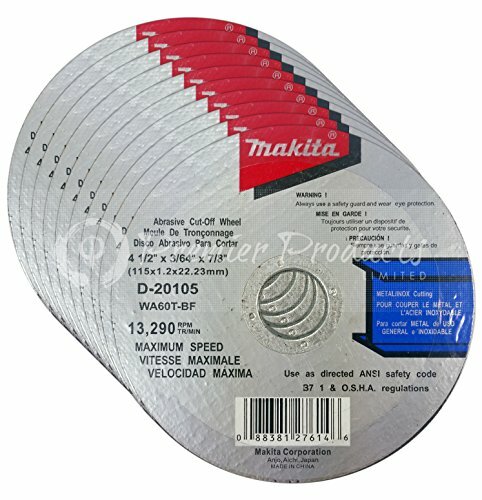 Diamond circular saw blade size 22mm (7/8'') suitable for cutting gems, glass and ceramics. The wood cutting saw blade discs are made of high speed steel and are 22mm (7/8''), 25mm (1''), 32 mm (1-1/4 ''), 35mm (1-1/2 '' ), 44mm (1-3/4''), 50mm (2''), suitable for cutting wood, plastic, copper, laminate and aluminum. 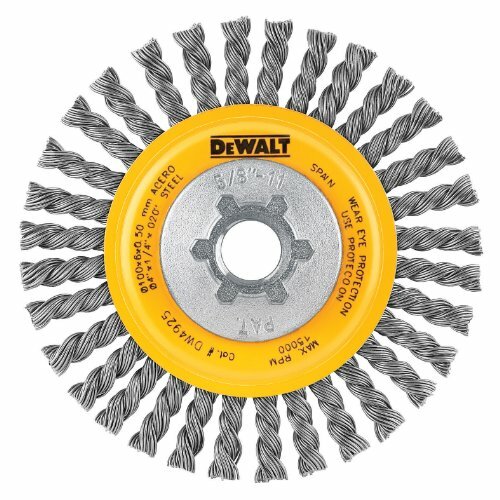 Resin cutting wheel 32mm (1.27''), suitable for cutting metal. Do not use too much force when installing the resin cutting piece. Great Tool for DIY- suitable for most power rotary tools. 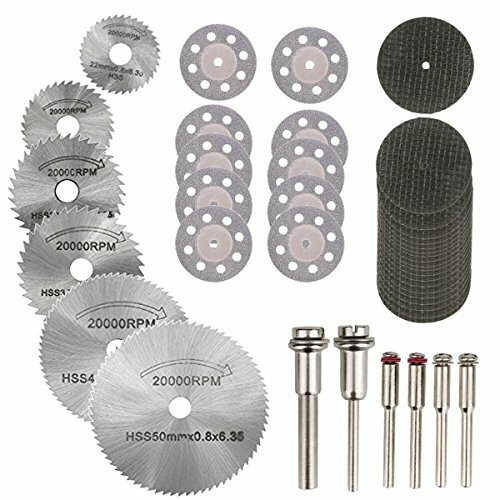 The rotary cutting wheel set is suitable for cutting wood, plastic, gemstone, glass, ceramic, stone, aluminum and copper. The mini rotary tool is suitable for DIY projects and the home hobbyist. 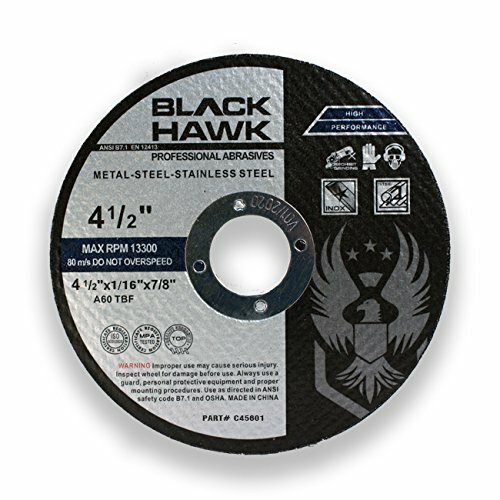 4-1/2" x 1/16" x 7/8" Cut Off Wheel by Black Hawk Abrasives is designed to cut and cut and cut without quitting. 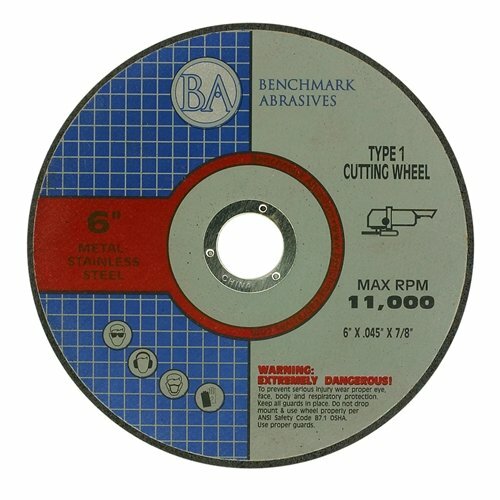 This disc features a 1/16" thick cutting edge for longer life and increased lateral strength compared to thinner cut off wheel alternatives thus making it ideal for aggressive cutting applications. 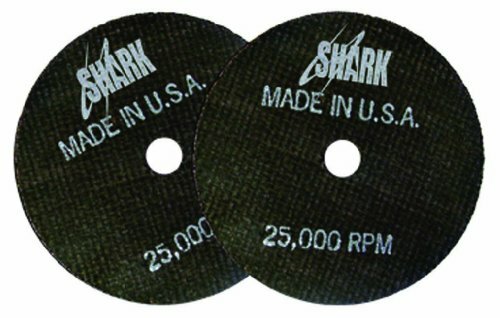 Additionally, these 4.5 inch cutting discs are fiberglass mesh reinforced for further safety. 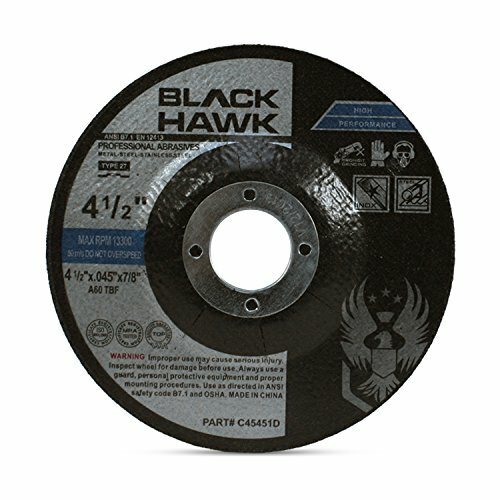 These 4-1/2" cutting wheels are made to be attached to an angle grinder and can be used to cut steel, stainless steel, fiberglass, plastic irons and all other ferrous metals. These discs are extremely versatile and can be used from applications ranging from general metal cutting to slicing rebar to cutting angle iron. 3-Inch by 1/16-Inch by 3/8-Inch USA made cut-off wheels. Double the life of imported wheels. Includes: 4 in. x 0.045 in. 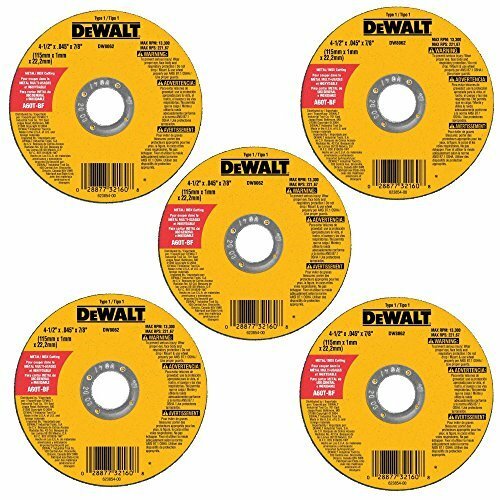 Metal and Stainless Steel Cutting Wheel (5-Pack) - DW8061B5. 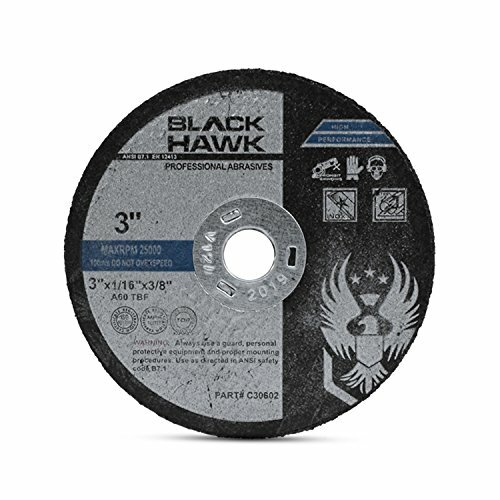 4.5" x .045" x 7/8" Depressed Center Cut-Off Wheels by Black Hawk Abrasives are Black Hawk's most popular 4-1/2 inch cutoff disc but now in recessed center form for flush cutting. 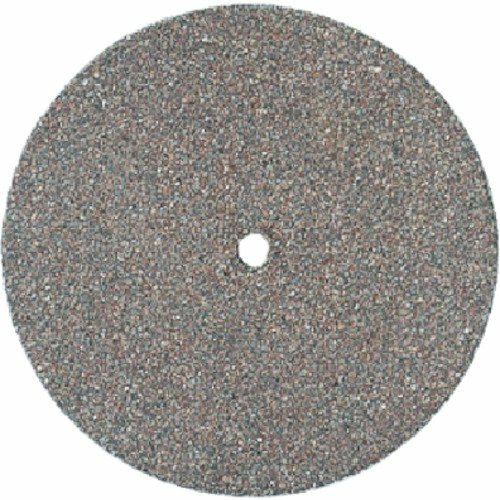 The 4-1/2" x 3/64" x 7/8" Type 27 cutoff wheel features premium heat-treated aluminum oxide grains, a double dose of high tensile strength fiberglass mesh reinforcement, and a T27 sunken center. 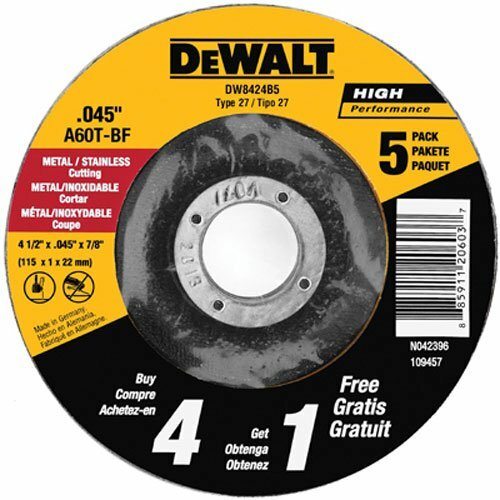 Diameter: 4-1/2" Grit: 40 Arbor: 7/8" Thickness: 1/16" Maximum speed: 13,200 RPM If you cut a lot of metal, then these cut-off wheels are sure to make the cut. The 10 aluminum oxide blades each have a 7/8" arbor and handle a maximum speed up to 13,200 RPM. The construction features double reinforced wheel with two full sheets of fiberglass for safety and performance. Material composition of the wheel consists of a premium grain for added wheel life and speed. 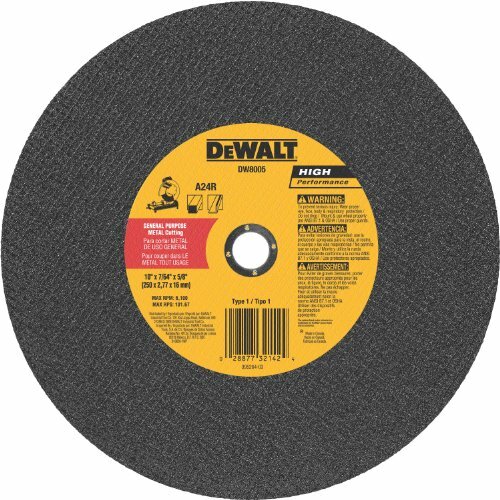 The chop saw wheel includes enhanced formulations which provide longer life and optimal performance. DEWALT inspects the high quality resin bonds for 100-percent quality before sale for product consistency and quality. 4" x 5/8"-11 arbor .020 carbon steel, Stringer bead, wire wheel, highly specified wire grades are constructed with internal holding plate to ensure consistency & safety, constructed for even balance which provides smooth performance, Knotted wire is for heavy material removal, crimped wire provides flexibility for light removal of rust & paint & general cleaning. 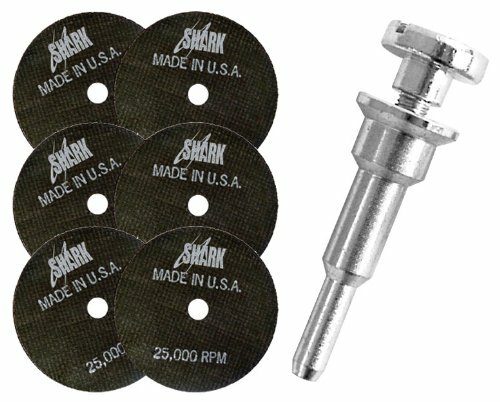 Shark Welding 26-6M Shark 3-Inch by 1/32-Inch by 3/8-Inch Cut-Off Wheel with Mandrel, 6-Pack. 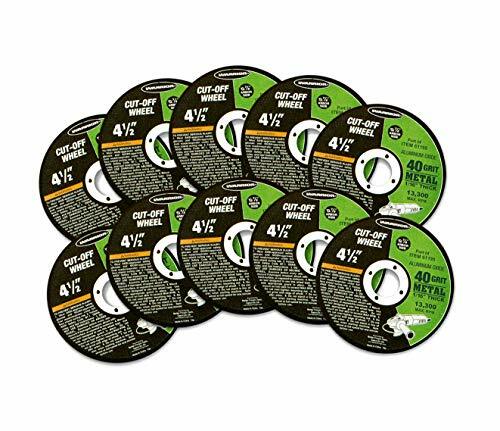 5 pack, 4.5" x .045" x 7/8", metal cutting wheel, 3 full sheets of fiberglass for durability & safety, use of 100% virgin grain for enhanced removal & long life, proprietary material mix to ensure premium performance, premium resin bonds 100% inspected before use, heavy duty cutting & grinding of ferrous metal such as steel, iron, weld blending & edge grinding aggressive material removal. 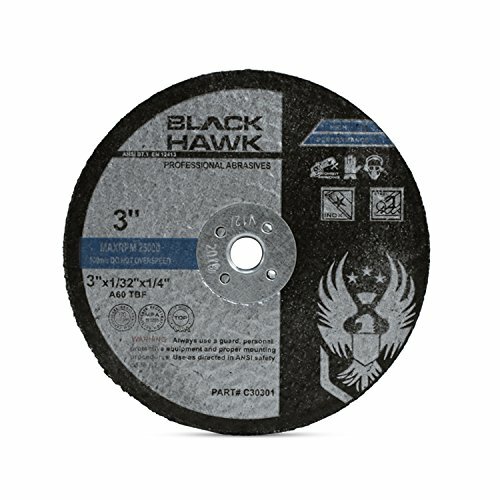 3" x .03" x 1/4" Cut-Off Wheels by Black Hawk Abrasives are thin but strong die grinder cutting discs built for fast slicing even on hard materials. Also, sometimes called whiz wheels, these 3 inch cutting wheels are made with reinforced fiberglass mesh and a heat-treated aluminum oxide grain bonding matrix for additional safety, lateral stability, and increased longevity. 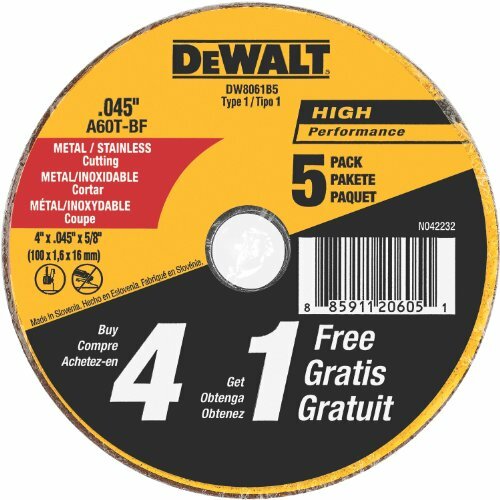 These 3" x .03" x 1/4" cutoff disc have a 3 inch diameter making them perfect for cutting in hard to reach places.